What is Saraswat Bank One Page Internet Banking? 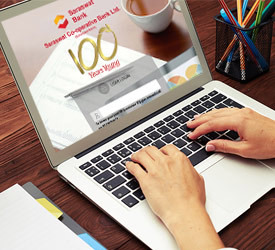 Saraswat Bank One Page Internet Banking is the easiest way of online banking anytime, anywhere, at your convenience; from your personal computer / laptop / mobile. I do not have any Personal Computer / Laptop? You can access Saraswat Bank One Page Internet banking facility from any computer/laptop with secured internet connectivity and an update to date anit-virus/anti-spam software. Who is eligible for Saraswat Bank One Page Internet Banking? Saraswat Bank One Page Internet Banking facility is available to all the customers/mandate holders having a debit card and with the authority to operate the accounts with full permission. What are the features/benefits of Saraswat Bank One Page Internet Banking? Linked Accounts: You can view your Savings/Current/Overdraft bank account details, account balance, and also download statements. Loans: You can view your Loan Account details at a glance (Principal, Outstanding Balance etc. ), download statements. Deposits: You can view your Term Deposit Accounts details at a glance (Principal, Maturity amount etc. ), download statements. Own accounts: Transfer funds to your own linked accounts. Inter Bank Funds Transfer (RTGS/NEFT/IMPS): Transferfunds to Other bank accounts. Fixed Deposit: Open Instant Term Deposit and Recurring Deposit receipts. Give stop payment instructions on issued cheques. Request for Cheque Book, Cardless cash withdrawals. Why should I register for One Page Internet banking? Saraswat Bank One Page Internet banking is the easiest way of managing the operations and transactions in your accounts 24X7 without a visit to your branch. Are there any charge / cost for registration of One Page Internet Banking? How safe & secured is the One Page Internet banking? Saraswat Bank One Page Internet banking is absolutely safe & secured with VAPT (Vulnerability Assessment and Penetration Testing) certificate from the authorities along with the certificate by RBI’s ethical hackers. The servers are protected with strong firewalls against malwares. We provide multiple layers of protection to secure your online banking experience. A high secured Login Id and Password is one layer of security to access your account. Second factor authentication is in the form of One Time Password (OTP) for all financial transactions. If an unknown user tries to access your account by using various passwords, your account will automatically get locked. Every time you log into Internet Banking, your last login date and time will be displayed so that you can keep a track of access to your accounts. Can I change the Login ID and password later? The login ID cannot be changed ever as it is the unique customer number assigned to you. The login password can be changed any time. It is advisable to change your login password periodically for your safety. How many passwords do I have for One Page Internet banking? There are only two passwords precisely Login Password & One Time Password (OTP). Login password complexity should be in the form of at least 8 alphanumeric characters consisting of 1 upper case alphabet, 1 lower case alphabet, 1 number and a special character. Your new password cannot be the same as your last one login password. Your login password would be expired in 90 days after which you have to change your password. OTP is the One Time Password which is sent to your registered mobile number while performing any transaction. The transaction will not be complete unless you enter the OTP in the valid option. If you are unable to receive the OTP on your registered mobile number, check whether your mobile handset is within the network area. If you still encounter the problem, contact your Mobile service operator or your nearest branch or enquire on Help Desk. What are the general precautions to be taken to protect my account on the internet? Do not disclose your passwords to anyone. Do not write it down. Avoid using the same passwords for all your online transactions. Change your password quite often to protect your account even if inadvertently you may have disclosed it to someone. Avoid opening or replying to spam emails, as this will give the sender a confirmation that they have reached a live address. Never respond to emails that request personal information. Create a complex password which will be difficult to crack. Avoid using cyber cafes to access your internet banking accounts. At cyber cafes PCs may be infested with viruses and Trojans that can capture and transmit your personal data to fraudsters. Beware of typing passwords on unknown PCs. Installing anti-virus software and keeping it up to date will help detect and disable malicious attacks. If the address bar is visible, the URL should start with 'https://' ('s' for secured) rather than the usual 'http: //'. At Saraswat Bank, we would never ask for your personal details through an email or through phone, fax or in-person. If any of our bank personnel asks you for your password, do not disclose it and report him or her immediately to us. What is Registered Mobile number? Your mobile number registered with Saraswat bank is known as Registered Mobile number. All information and updates, all OTP, transaction confirmation messages will be received on the same mobile number. Is it mandatory to register my Mobile number & Email Id with Saraswat Bank? You must register with Saraswat bank; your mobile number for SMS facility & Email Id for notification purpose. I am a Joint holder in the account; can I use the separate Username & Password? Being a joint holder you would be assigned a unique customer number which would be different than your 1st account holder. With this unique customer number and your login password you can access One Page Internet Banking. I am still unable to login with the Username and Login password? After three incorrect login attempts, your Login ID gets locked. In such a case, you need to reset your password using debit card credentials. If you still encounter the problems, contact your nearest branch or enquire on Help Desk. What is Session time Out? I am getting error of ‘Session Time Out’? Once you are logged into Saraswat One Page Internet banking, your session will be automatically expired after 180 seconds of idle time. It is one of the security features. How to open a new Fixed Deposit receipt? Post the validation, click on "Submit"
On clicking Submit, your request for the new Term Deposit account/receipt will be placed. A confirmation message will be sent to you on your registered mobile number. Note: In cases where there are any exceptions in your account viz. (Customer not authorized, KYC not complied etc.) your request for new Term Deposit account/receipt will not be processed. In such case, you will have to contact the nearest branch for further process. Can I close my existing Fixed Deposit Receipt? You will not be able to close the Fixed deposit accounts/receipts online though you have created the same online. For any premature closure or closure on maturity of any of your fixed deposit receipts, you will have to contact the nearest branch for the further process. What is the Fund Transfer? Fund transfer is the facility that allows you to transfer funds from your accounts to any of your linked accounts or any other Saraswat Bank account or any other Bank account through RTGS/NEFT/IMPS. The funds transferred to your linked accounts or any other Saraswat Bank accounts are credited instantly. Funds transferred through IMPS are credited instantly. Funds transferred to any other bank account through RTGS and/or NEFT before cut-off time will be credited on the same day and post cutoff time would be credited on the next working day. What is the cut off time for RTGS/NEFT/IMPS? The daily transaction limits for the existing users are the same as the user may have defined previously. Existing or New users can enhance or reduce the daily limits through ‘Manage limits’ option provided under ‘E-services’. What details do I need to provide in order to utilize fund transfer facility to Other Bank Accounts (RTGS/NEFT/IMPS)? For the safety of your account, the fund transfer facility through Internet Banking will be available only after the cooling period of 2 hours for the new payees added either through Saraswat bank mobile application or Saraswat Bank One Page Internet banking. Also, funds transfer to a specific beneficiary is allowed only twice per day. i.e. Only two transactions can be executed for one beneficiary in a day. Under E-services, there is an option of ‘Update Email ID’. You will be prompted with your existing email ID registered with the Bank. The new email ID can be entered and click on ‘Submit’. Your new email ID will be registered with the Bank. What is Link Aadhar number? If your aadhar number is registered with the Bank, you can link your account to the Aadhar number to receive the Govt. /gas subsidy directly in your account. In case where Aadhar number is not registered with the Bank, contact the nearest branch for the further process. What is activity log report? Activity log report displays all the activities executed by you from login till logout. What is Cardless cash withdrawal? Cardless cash withdrawal is the innovative withdrawal service. In case if you forget your debit card and you are out of cash, you can instantly place a request through internet banking cardless cash withdrawal option. Once the request is placed, you can withdraw cash from any of Saraswat Bank ATM. Note: This request can be used only once a day i.e. Only one request per day can be placed. What is Mobile Banking Registration? In case if you are not using the Saraswat Bank mobile application, you can start using it instantly. Download the app from Play store. Login to One Page Internet Banking. In mobile banking registration option, you have to enter the mobile number and set your login and transaction pin (4-digit numerical pin for both). Once completed, you are registered for mobile banking. Start using and enjoy the Saraswat Bank mobile application with many new features to explore. What is view 26AS statement? You will be redirected to the TRACES website. What is stop payment of cheque? Stop payment of a particular cheque can be done before the encashment of the cheque. Enter the cheque number you wish to stop and click on ‘Submit’. The request will be processed instantly and the charges of Rs.25/- plus service tax will be debited from your account. What is Inward Clearing Cheque? You can view the details of the issued cheque presented in the clearing for the day.